Hear about New Year's customs and superstitions of Belgium, Portugal, Turkey, Wales, the Netherlands, Spain, Sicily, Hungary, and Scotland. Then brighten your New Year with new tips for pairing the right kind of pasta and sauce, and learn the dos and don’ts of attending a dinner party in Switzerland. Stacy Gibboni's husband operates the Bentigodi di Chef Domenico restaurant in Venice. It gets many rave reviews from diners on Trip Advisor. Stacy Gibboni's artwork in Venice is featured on the Insightful Travel and Tours website. Mehlika Seval has posted a slide show of the Biblical Sites of Turkey on You Tube, and is the author of the "Step by Step Ephesus" guidebook. Diccon Bewes moved to Switzerland from his English homeland. He's the author of "Swiss Watching" and "Slow Train to Switzerland." Edinburgh's three-day Hogmanay New Year's street festival is one of the largest of street parties in the world. Scottish singer Jim Malcolm sings "Auld Lang Syne" at the end of the program. 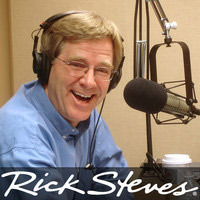 He was a guest on Travel with Rick Steves programs #363 (May 2014) and #392 (January 2015).